If you are using C# (or VB.NET), I've made a library that makes the json api into typed .NET objects. It currently supports all json api functions in NRS 1.10.2 and supports .NET Framework 4.0 & 4.5 as well as .NET Platform Standard 1.3. All 245 api functions found in Nxt core client API, with typed request/responses. More info on how to find the functions here. Support for local signing of transactions, without having your secret phrase leave your local application. Sample program can be found here. Support for local message encryption/decryption/compression/decompression, with full compability with NRS messages. Support for local token generation and decoding. A Password Generator, with support for variable bit strength (128 is default). The same logic and dictionary as NRS is being used. So, if you are a .NET developer, try it out and let me know if there's any problems. Whoop! Now that is a bloody good idea.....stay on it, please, mate. Damelon and myself haven't got round to actually announcing this yet, but we'd been thinking/brainstorming about offering bounties for the creation of libraries/wrappers for the NXT API, just to make life easier for any devs who may be thinking about using NXT. So, there will be a bounty, and I think we could also do with Python and Ruby .libs as well.....subtle hint to everyone. What a coincedince, I also have a project going under the same name. Pretty close to finishing that one. Mines a little different, but this one looks really cool. That's great and IMO he really deserves a bounty! BTW do you know that .NET exe can run on linux and mac as well? Use the mono package, it's amazing! Hey, that's great, NXT is getting more and more interesting for me! I currently have problems installing the NxtLib via NuGet, i am getting an error: The package "NxtLib 1.0.9"can't be installed. You are trying to use this package within a project that referenced ".NETFramework,Version=v4.5", the package doesn't include assembly references or content files that are compatible with the framework. Consult your package creator. I already tried different .NET versions in my project, same error. I have not tried .NET4.6, do i need this? Anyway, thanks a lot for your work!! Of course I'll stay on it, I have a few ideas on improvements to make it more than just a json api wrapper, but I'll announce that in due time. Finish it! I'm sure everyone will benefit from having more than one lib, as we will have different advantages/disadvantages. Having same name might be a source of confusion though. I've never used mono package, but I'll look into it. Target framework for NxtLib is set to 4.5.1, so if you use that in your project also it should work. But it would make sense to lower it to 4.5 as it is the version that is shipped with windows 8. Also mono is supporting 4.5, so that's another reason to lower it. I'll do that in next version. Released version 1.0.10 to nuget & github. * Downgraded to .NET 4.5 (from 4.5.1) to improve compability with Windows 8 users and future Mono integration. 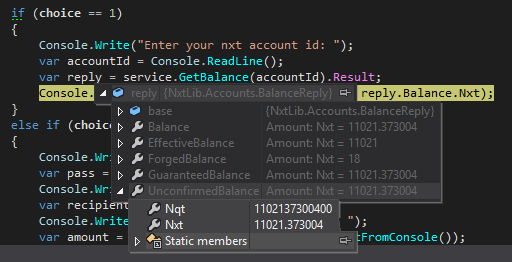 I'm now able to install your NxtLib with NuGet and will start some test coding soon. I'll let you know the results. Thanks for adjusting it to .NET4.5, thanks for your support, and again thanks for your work doing this! It will make life much easier while programming for NXT in C#. In case there is a bounty, i would say you definitely deserve it! If you have any feedback, find bugs or suggestions, don't hesitate to post here or contact me directly. This has been a one man project, and it's easy to become blind for flaws that are obvious to others. I'm working on various Nxt C# projects like NxtLite, BoatNET and NxtHypeDns.. I'm sure I can capitalize on NxtLib in some way or another. Along some minor updates, NxtLib now also has the ability to locally sign transactions. It's useful if you don't have a trusted Nxt node or if you need to transmit your secret phrase via a public network. Just what I was looking for! Gonna give it a spin, ty! - Added support to locally compute account id from public key. - Added support to locally compute account rs address from accoun id. - Added support to locally compute account id from account rs address. - Internal re-organization and refactoring. - Bugfix for local signing of transactions. - Added Android (Xamarin) support. - Modified AccountService.GetAccountTransactions() and GetAccountTransactionIds() to accept TransactionSubType enum instead of byte values. If you want to start using NxtLib with 1.5.9, get the latest code from the branch "develop" on github. Everything should be done except for tagged data, which I'll try to finish this week, then I'll push a new version to nuget. Please note that this version is not backward compatible with older versions of NRS. is there a update planned for the NRS Version 1.5.15 or 1.6.0 (e)? Just saw it for the first time... Great job you did there! (very professional coding). Why didn't you use Web API? It has a built-in json serializer/deserializer, it considered best practice today, also fully integrated with REST, and easy to consume and work with.